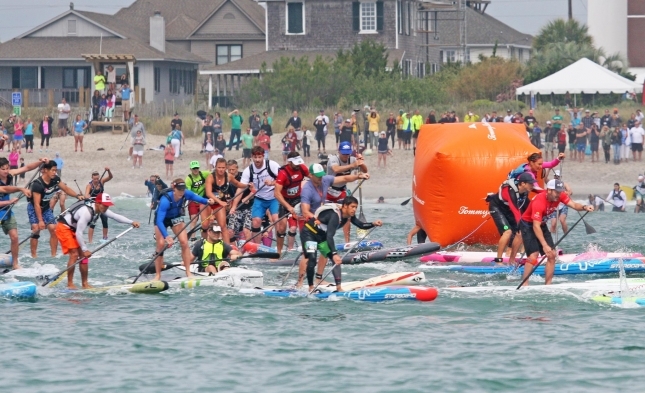 The World Paddle Association (WPA) has just announced the 11-race World SUP Tour, a new international series that aims to bind many of the sport’s biggest standalone events. The World SUP Tour (WST) will include three of the ‘majors’ – Carolina Cup, Gorge Paddle Challenge and Pacific Paddle Games – along with eight regional events in five countries. The WPA, founded almost a decade ago by SoCal SUP pioneer Byron Kurt, has been fairly quiet the past few years, but today’s announcement suddenly jolts the Association back into life. Along with Carolina, the Gorge, PPGs and three regional U.S. events, the new tour also includes races in Puerto Rico, China, Korea and Canada, along with a ‘TBA’ event in Asia. The headliner is the Pacific Paddle Games, the most competitive race in the world and the traditional “season ending event” that took over from where the beloved Battle of the Paddle left off. Although the exact format and points system (and almost all other details) are still yet to be revealed, the WST plans to crown a men’s and women’s “world champion” at the closing of the PPGs. There will also be an end-of-season cash bonus for the top finishers courtesy of headline sponsor Salt Life. In some ways, this new World SUP Tour has echoes of the old Champions Tour, which ran in 2014 in an attempt to create a common thread between the biggest races (though the WST features far more stops). Just like the CT, the WST has a distinctly American flavour, with more than half of the 11 events in the USA. We await more details about this new series, but for now here’s the race schedule. The announcement of the WPA World SUP Tour comes just a couple of weeks after the Waterman League (WML) unveiled their new APP World Tour (Association of Paddlesurf Professionals), which is the rebranded version of the old Stand Up World Series. That means we suddenly have two new world tours. Do we need two world tours? Of course not. I don’t even think we need one (but that’s a whole ‘nother debate). However, while there’s an obvious clash between the APP and WST, both are taking very different paths with very different goals, and I can see positives in where each tour is trying to go. The Waterman League’s APP World Tour is attempting to bring mass-market excitement and revenue to the sport with an exclusive, invite-only series. That mainstream appeal is something our sport certainly needs, and after years of struggling financially the WML finally has the money behind it to reach that goal. On the flipside, the APP is still missing the biggest races in the sport such as the Gorge and PPGs, which will leave an asterisk next to its “world tour” ambitions. So I guess if you wanted to sum up each “world tour” in just a couple of words, the APP would be “money/excitement” and the WST would be “grassroots/community” (or something like that anyway). Side note: Neither tour includes the likes of Molokai, OluKai, the JM Survivor, the EuroTour and anything in Australia, New Zealand, South Africa, Brazil or Tahiti, which means both “world” tours are still missing a big part of the world. I don’t think either series is better or worse, and there’s a chance they could coexist despite the obvious clash, but it’ll certainly be interesting to see which one enjoys the most success (and support from athletes) considering both are marketing themselves as world champion-crowning tours. Throw in the ISA Worlds and suddenly it’s getting very crowded. This year we’ll have the two ISA world champions (beach race and long distance), the APP world champion and the WST world champion. So there could be four different men and four different women all claiming ‘world champ’ status by the end of the year. That’s quite a lot of “world champions” for our humble little sport.